There’s nothing quite like enjoying a cold beverage or sharing a plate of food with friends outdoors on a warm summer evening. Add to that a prime view of a beloved local baseball team and the ease of a convenient downtown location and you’ve got a taste of The Patio, our amazing outdoor eating space attached to our Hilton Garden Inn in the heart of Manchester, NH. Since its opening in 2006, this inviting and elegant plein air dining area has become a favorite for baseball fans, presidential hopefuls, and downtown visitors alike. In the decade since, we’ve made a few improvements with an eye on expanding service beyond just the baseball season - and the result has been one of the most exciting dining projects we’ve worked on to date. With a newly-redesigned layout and updated furniture along the seating area, The Patio offers the perfect place to settle in for something delicious, drink in the atmosphere, and enjoy a night out. Although long known as one of the prime places in town to watch the New Hampshire Fisher Cats play ball, The Patio had traditionally been a separate entity from the ballpark itself. That changed alongside renovations to the park in 2017, which opened up direct access for to the park itself for guests here at the Patio. In addition, we found that having only one entrance to the outdoor eating area itself - through the hotel lobby - made the space that much less accessible for passers-by whose interest had been piqued. That’s why we installed a new direct entrance right to the outdoor dining area, making it easier for ballpark visitors to directly access the space. Add in a new batch of wood-topped dining tables and chairs, along with newly-acquired wicker lounge chairs and tables, and we’ve managed to make the outdoor space at The Patio uniquely inviting, and yet seamlessly attuned to the atmosphere within the hotel lobby. 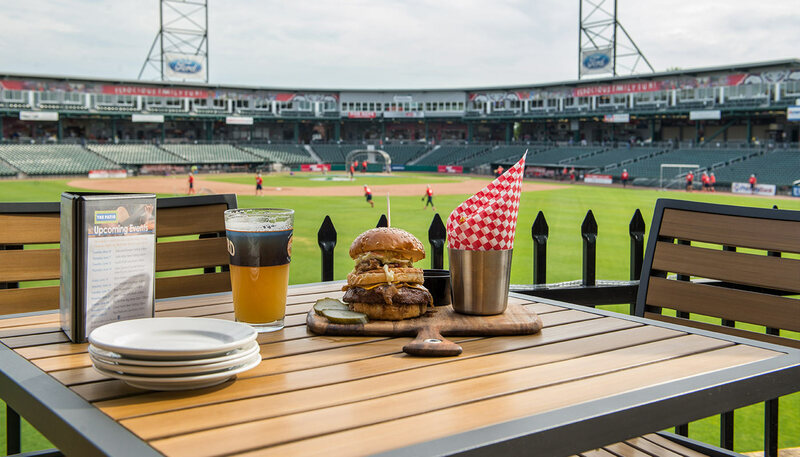 While The Patio may have become something of a best-kept-secret for Fisher Cats fans and visitors to Delta Dental Stadium since its opening, we quickly realized that this inviting dining area should not be limited to only those coming to enjoy a game. Situated conveniently along the Merrimack River - and, now, right next to the popular Residences at Riverwalk living community - we saw a large potential market of regular, local fans and began tapping into what we could do to earn their attention. As part of our renewed focus on offering plenty of ways for our neighbors to come and enjoy The Patio even during non-game days, we’ve taken bold strides in the direction of local advertisement in and around the immediate area. In addition, our focus on providing other kinds of entertainment - from musicians to Pint Nights and other special events - we’ve worked to make the Patio the perfect place for Manchester to come and kick back at the end of a long day. Few things flavors may beat that of a classic hot dog or popcorn at the ballpark - but for those looking to take the eating experience up a notch, The Patio fills the gap with a variety of delicious dishes. Combining classic American pub fare with a wide selection of draft beer on tap and a signature selection of craft cocktails, The Patio makes for the perfect mid-game snack or mid-week meal. And with chef Dana Marchand leading the team, guests are sure to find something exciting waiting for them on every menu. Care To Stop By Sometime? Come visit The Patio at 101 South Commercial Street in Manchester, NH, or get in touch with our team and let’s discuss how we bring positive change properties just like this one all throughout the region we call home.